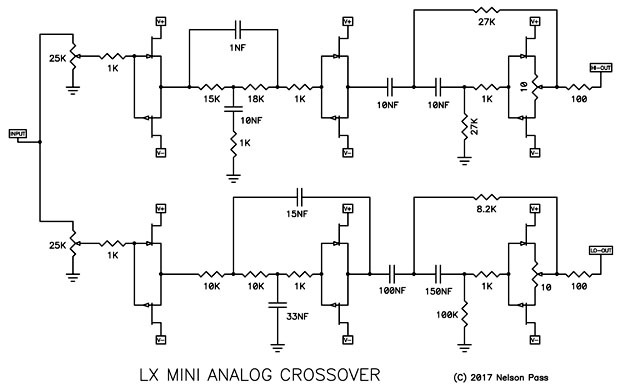 My friend and neighbor in Sea Ranch, Nelson Pass, was inspired to develop an analog crossover equalizer for the LXmini. 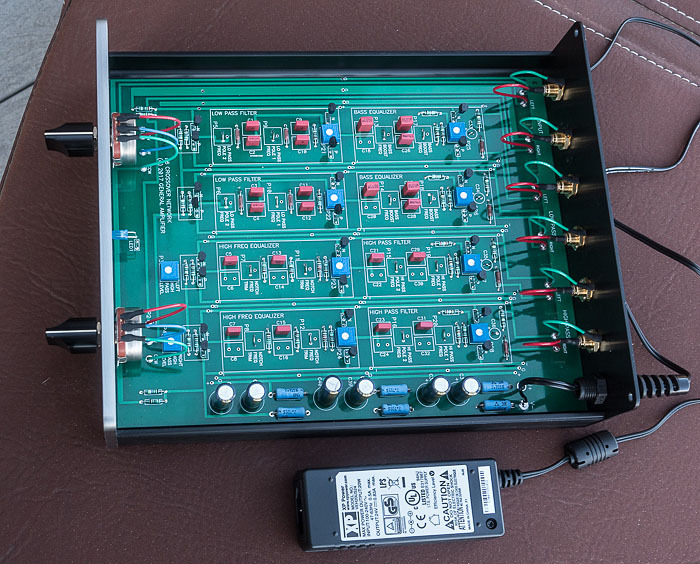 The transfer functions for the LXmini woofer and tweeter equalization were derived from free-field acoustic measurements and originally implemented, together with a standard LR2 crossover, in a miniDSP 2x4 digital signal processor. 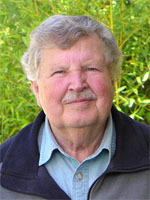 Nelson approximated the original woofer and tweeter frequency response curves of the DSP with minimalist analog circuitry. 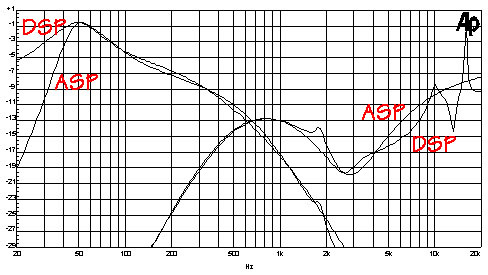 Above 1 kHz there are deviations, which have surprisingly small sonic consequences. But we are not yet completely settled on a final curve. As it is now, I could gladly live with what we have, and refinements would likely be very subtle only. All active devices are unity gain, complementary JFET buffer stages. Harmonic distortion is below 0.001%. It rises to 0.01% at 7 Vrms output, which is far more voltage than needed to clip most common power amplifiers. Note the low component count and simplicity of circuit topology. Though that comes with limitations in what frequency response curves can be realized, it fits Nelson's philosophy of Zen-like beauty in design and nicely matches my design philosophy behind the LXmini. The circuit runs off +/-12V rails, which are derived from an inexpensive 24VDC switching supply. 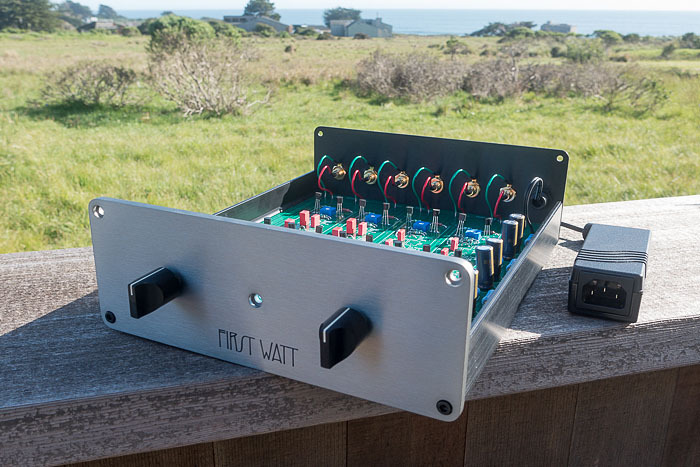 Here is the LXmini ASP implementation, which very much follows the construction format of an earlier xo/eq product from Nelson's First Watt company. His craftsmanship and quality of work are impeccable and admirable. An inexpensive, high quality blank circuit board for the LXmini ASP will become available via the DIYAUDIO STORE and all LXmini construction plan owners will have access to the DIY circuit assembly information via their support page. Next, Nelson plans to build up an LXmini+2 and possibly develops a 3-way ASP for it. Still in the works is a circuit board design for the LXmini+2 ASP. It would also serve the LXmini without dipole subwoofers. 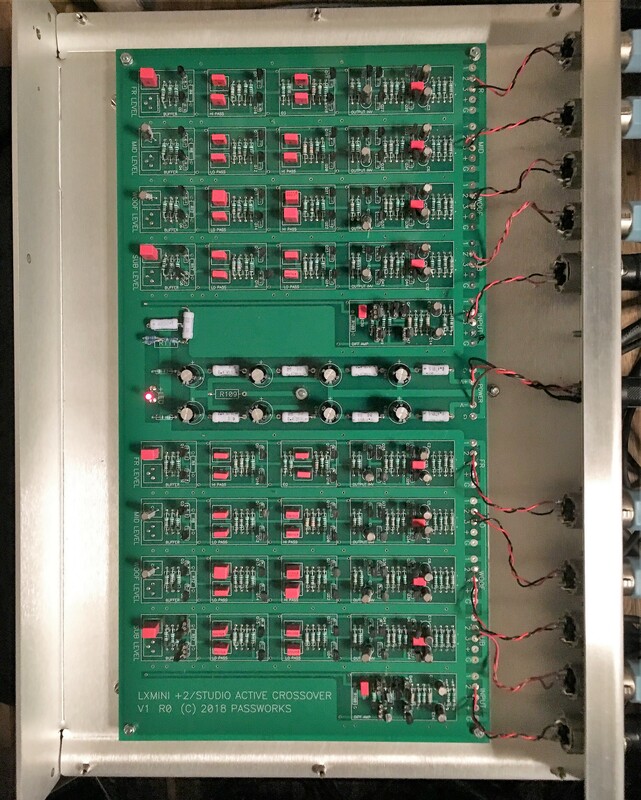 Nelson's plan is to show a working LXmini+2 analog system at Burning Amp 2017. 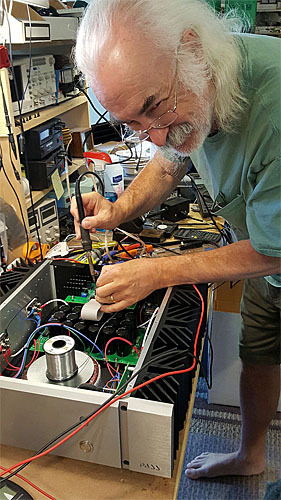 Be sure to read the stereophile interview with Nelson. It's just as I know him! ASP based crossovers (Nov 2018) are e.g. DIYaudio 2-way unbalanced kit from diyaudio.com.